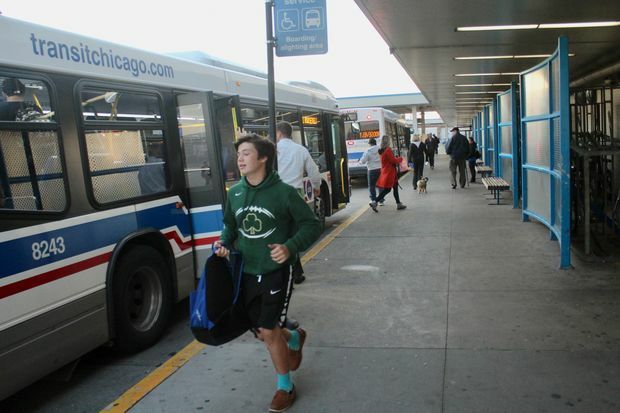 With about 20,000 daily commuters, the Jefferson Park Transit Center is the city's second-busiest transit hub outside Downtown. JEFFERSON PARK — The web of transit routes sprouting from the Jefferson Park Transit Center was a big reason why Tim Mertens and his wife chose to move with their two young children to the neighborhood in 2014. But he wishes there were more to see in the evenings when he hops off the train from his job in the Loop, he said. "We like the small neighborhood feel, but we'd like to have more to do within walking and biking distance," Mertens said. "There isn't really a walkable space where there's a high density of businesses and restaurants you can go to." 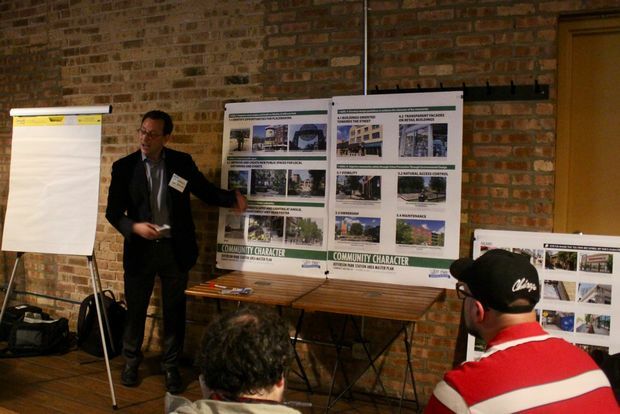 Mertens echoed a common lament among the roughly 100 neighbors who filled the annex of the Copernicus Center, 5216 W. Lawrence Ave., Monday night to help guide city and regional planners as they piece together a long-term master plan for downtown Jefferson Park. Set to be released early next year, the document will crystallize a year-long campaign to generate ideas on how to ease neighbors' access to the transit center and breathe new life into the surrounding business district. After a preliminary public meeting in June, planning consultants at Monday's session invited participants to vote on their favorite ideas using stickers. By the evening's end, printed goals like "Pedestrian-oriented lighting," "Mosaics" and "Street reconfiguration for safer crossing" were covered in sticky green dots. Ald. John Arena (45th) has said he expects the plan to follow the same guiding principles as a similar document completed in 2013 for the Six Corners Shopping District, which called for a heavier concentration of homes as an incentive for more businesses to set up shop. Arena has credited the document with helping breathe life into the area, which has since seen dozens of new shops and restaurants open. But some long-time neighbors, like Frank Weisz, were wary Sunday of wooing ever more large-scale developments, especially since Arena has already ushered in three multi-story apartment complexes within a block of the transit center in the past year. "I moved to this neighborhood for one very specific reason, and that's because it's a neighborhood of families," said Weisz, a 30-year Jefferson Park resident. "If I wanted to live in tony, hip neighborhood, I'd live in Wicker Park. "I'd like to see some more businesses, sure, but what I'd like to avoid is Starbucks and other big chains coming in to replace all the mom-and-pop stores," he added. Weisz also expressed concern that the new development would choke traffic and squeeze parking — a fear shared by dozens of other participants in Monday's meeting. Of the more than 60 ideas printed onto poster boards, the top vote-getter — with 33 stickers — was "Shared public parking garage." Although planners can design space to maintain public parking, the reality of development means those efforts are necessarily limited, according to Scott Goldstein, a consultant involved in drafting the plan who helped facilitate Monday's meeting. "I think there's a way to have a balance there," Goldstein said. "But if you're looking at the business districts we're constantly hearing about [emulating], like Park Ridge and Lincoln Square — those aren't necessarily the easiest places to park."